B.A.D. 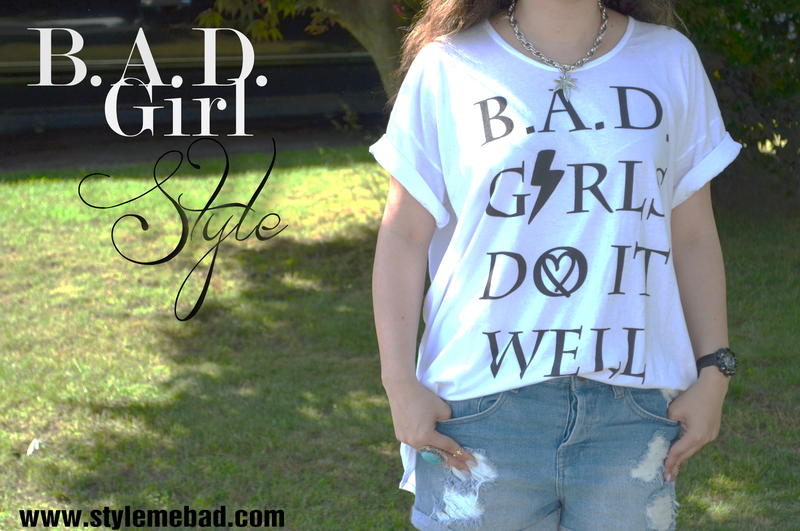 Girl Style: We Do It Well | Style Me B.A.D. My dad told me I looked like a 90’s fly girl from the old school TV show ‘In Living Color’. I’ll take it as a compliment since 90’s style is back and J.Lo was a fly girl! But really I just wanted to be comfy and a hat was necessary since my hair looked cray-cray. I am also rocking one of the new tees I designed for MyTee B.A.D. it’s over sized and super comfy, which makes it perfect for those days when you want to be comfortable, but still make a statement! My blog readers can get one and save 20% on your order with discount code SMB20! Me too! I remember you telling me about the rhythm nation hat! Thanks for the comment love! This is sooo freaking cute!! I love your comfy look. The tee is amazing. Great design! I also love your hat. We all have those kind of hair days when all we want is a hat. Live fast Die young BAD girl do it well!